The Multihog name has become so synonymous with efficient, safe and cost effective head of stand clearance that it is hard to believe that just a few winter seasons ago this procedure was a knotty problem for airports around the world. All sorts of combinations of various pieces of equipment had been tried but none were judged to be wholly satisfactory. Multihog’s sterling performance when it first touched down at airports proved that it would do just what the manufacturers promised and scores of units have since been delivered. It is not often that a new piece of equipment has such a transformational impact on working practices, but repeat orders underline the machine’s unrivalled suitability for the job, its reliability and powerful performance. 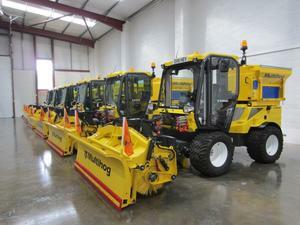 Bristol Airport was an early convert to the Multihog system, and the two machines in place for the 2012 winter season were such a boost to operational efficiency in periods of bad weather that a third unit was delivered in April 2013. 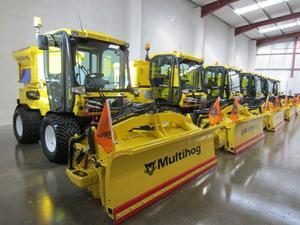 East Midlands Airport was so impressed with the performance of its first Multihog that just a few months later funding was brought forward to acquire a second. Not to be outdone by their regional counterparts, both Gatwick and Heathrow, which run large fleets of Multihogs, are also repeat customers. Alongside an excellent product, what stands out for Multihog customers is the complete package, ranging from the initial consultation from the sales force through to after sales service, support and maintenance. – David Charman, Airfield Operations Safety Standards and Training Manager, Gatwick. © 2014 Multevo ltd. All rights reserved.